Camp Jungle Lore is a unit of UFDC - Uttaranchal Forest Development Corporation located at a walking distance from the main Bijrani gate, of Corbett National Park. It is situated on the periphery of the Corbett National Park right above the river bed of Kosi. The closeness of Corbett Jungle Lore with the river and the forest area offers an ideal setting to contemplate in solitude. You can choose from several outdoor activities for entertainment. It is an ideal place for bird watching, and for convenient walks as the entire place is flourished with fruit trees. It also houses Gol Ghar restaurant. 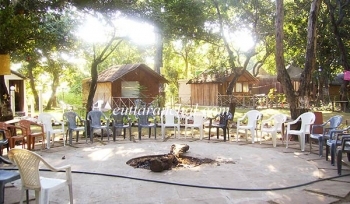 The cottages and tents are well equipped with modern amenities. The cottages and tents are situated with a gap of few meters providing privacy. The resort has a good walkable and sitting area. Corbett Jungle Lore offers Indian style cottages. Jungle Lore provides 7 bamboo cottage huts. These bamboo cottage huts are spacious and it consists of three cozy beds. 7 Deluxe Twin bedded tents comes with attached toilet. There are 14 normal triple bedded tents and 2 Jumbo eight bedded Tents in the Corbett Jungle Lore. All cottages consists of basic modern facilities including attached bath, running hot and cold water showers, toilet, cooler/heater, comfortable furniture and mini refrigerator. Jungle Lore houses a cozy, unique and thatched dining room named as Gol Ghar. In Hindi language ‘Gol Ghar literally suggests circular house and this defines the architecture of the restaurant. The restaurant serves Indian, Mughlai, Chinese and Continental cuisine. Special theme dinners can also be arranged on request. Enjoy the serenity and salubrious environs of Corbett National Park at Jungle Lore. Jeep Safari, Elephant Safari, Angling, Bird Safari and Nature Walks are the popular activities that you can perform while a visit to Corbett National Park. You can also play indoor games for entertainment. Corbett Jungle Lore is situated 260kms from Delhi near the Bijrani gate of Corbett National Park. Trains to Ramnagar and Kathgodam railway station are easily available from major cities of India. Taxis to Ramnagar are easily available from major towns of Uttarakhand state. Bijrani Gate is situated 3km from Ramnagar. The nearest International Airport is New Delhi situated at a distance of approximately 260kms.